Dead End Follies recently published a list of 10 up-and-coming authors everyone should be reading. One of the names on that list was Ryan Sayles and since I've had The Art of Brutality on my To-Be-Read pile for quite a while, I knew I needed to take the plunge and see what all the hype was about. After reading this stellar book, not only do I see why all the hype concerning Sayles is warranted, I am surprised there's not more hype surrounding him. Richard Dean Buckner is a former cop, turned private eye who is hired to find a missing woman. Buckner's not your typical PI who simply follows the clues to solve a mystery, he's a throwback to an era when law enforcement extracted revenge on perps and followed their personal moral compass. An age when PIs didn’t care if they trampled the alleged rights of the scum they were hunting. Buckner is a strong lead character who was easy to root for, and dare I say, love in a special way, because he will save you from the evils of the world and do it in a way that leaves no question that the bad guy is eradicated. When Buckner makes the promise to find a missing woman, he doesn’t realize how far the case will take him into the bowels of human misery. He discovers the hell that's been this woman’s life and how far into this living hell she may have fallen. Every page of the book seemed to introduce new potential suspects in her disappearance and also new levels of depravity that humans inflict upon each other. 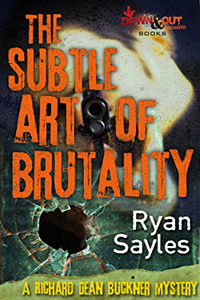 The strength of Sayles’ writing style is the brutality his words bring to the page, yet his style is one of simplicity. Perhaps it is because his main character is such a straight forward “man of few words”. The story is dark, twisted, and simply stated, a pleasure to read. Sayles is a poet and his poem is one of human misery and deprivation. Very few books leave the impact this book left on me when I read the last page. I am a big fan of his and I can only wonder what hole I've been living in to wait so long to enjoy this fine novel. If you haven’t read this yet, you are in for a treat. The best part? There is already a sequel…I can’t wait to revisit Sayles' morally-bankrupt world again.